When I did a product information post on the summer Pocky releases, I didn't really expect to find myself sampling them. However, my husband and I recently moved to a new place - and note that this is our sixth move since returning to the U.S. and I can say with experience now that moving is absolute hell - we found a place within walking distance of a Korean market that has the lowest prices I've ever seen on these types of limited edition Pocky. When I saw this for $1.99, I figured that there was no reason not to try it despite my reservations about the flavor. What reservations are those? Well, they are the ones which say that this is going to taste like bad dairy or powdered milk at best and some sort of savory cheese like Gouda or Cheddar at worst. That was my initial concern when I wrote the product information post. There's something rather cool about making such a prediction and seeing whether or not it comes true. 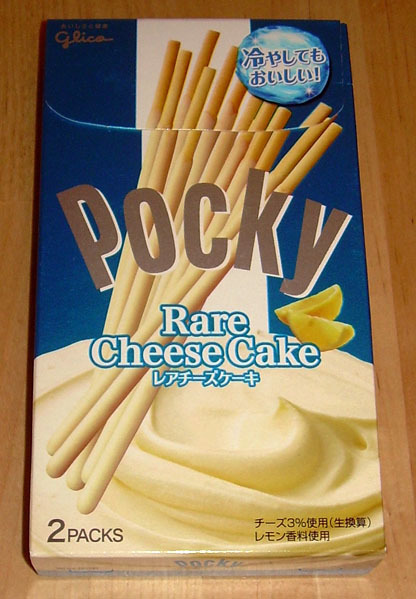 "Rare" cheesecake means that this should taste like cream cheese. It should not be especially pungent or have the sharpness of an aged cheese and should possess a delicate sweetness and a rich undertone of fattiness. Yeah, I'm expecting a lot out of a psuedo-chocolate goo coated pretzel stick. After opening the packet, I gave it a whiff and it smelled funky. My husband said that "it's a fine line between rare and bad cheese". This is definitely treading the line. It smells like milk that is going off, but isn't quite at the scary level yet. You could probably get away with keeping it for one more day and using it in your coffee or tea, but you're not going to want to drink it straight. Pocky does not live or die on scent alone. In fact, I'm guessing most people don't even notice the aroma. The first bite tasted a bit "cheesy" to me in a not so good way, but subsequent bites allowed my tongue to acclimate and it wasn't so bad. In fact, there is definitely a progression when you eat these. The first bite is "too much" pungent dairy. The second is mellow sweet somewhat milky, but slightly cheesey in a good way flavor and the third has a nice lemon kick to it. 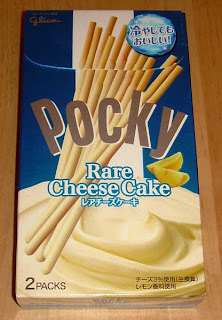 This is not the greatest Pocky on the face of the planet, but it is unique and kind of tasty once you get paste the first hit of strong "cheese powder" flavoring. It's has that sort of quality that you find in which a food becomes better as you eat more and it encourages you to chow down on the whole package at once. In this case, it at least helps you avoid the slightly unpleasant sense of that initial bite if you eat a whole package (170 calories) at once. 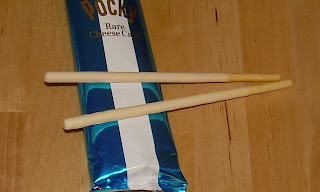 Since coming home, Pocky has been growing on me. I didn't care much for it in Japan, but I do like the pretzel goodness more than I used to. I'm not sure if that is because I no longer have access to certain other types of snacks or if I'm just more inclined to give it a chance. Whatever the case may be, I liked this, but perhaps only enough to try it about once a year. If I had a rating between "indifferent" and "happy", this would get it. In all fairness though, I did enjoy it, so it gets a smiling sumo wrestler. I really enjoy reading your blog posts. The descriptiveness almost makes me believe I myself am tasting the product. As much as I like reading your thoughts in text, have you ever thought about video recording your snack reviews? maybe as a sort of 'segment' of some sort on certain days? It would be lovely to see how the actual snacks look like and your reactions to eating them. Hi, Camille, and, yes, I have thought of doing a video bit. The main things stopping me are a lack of adequate lighting and no tripod. Also, I know most people hate video reviews because they tend to read blogs from work and can't watch them. It's still something I'm considering, and given that I make about 10 cents a post (my ad revenues barely pay for the food I buy, if that), I'm not likely to invest in equipment to do such a segment. Still, I'll keep it in mind! Thanks so much for your kind comment and for reading! Btw, they just released a Rum & Raisin Pocky..it didn't get my stamp of approval though!